The 20.5% return for the 2016 Dogs of the Dow exceeded the performance of both the Dow Jones Industrial Average and the S&P 500 Index in 2016. 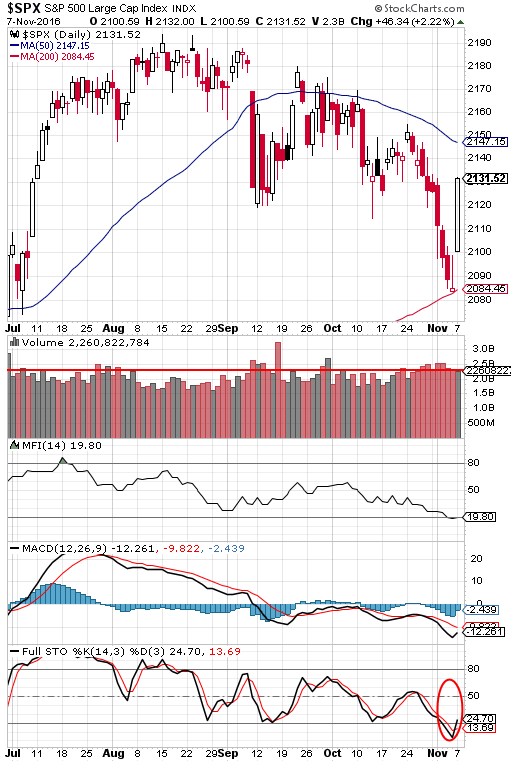 The Dow Dogs returned 20.5% versus 16.4% for the Dow Index and 12.0% for the S&P 500 Index. The best performer of the Dogs was Caterpillar (CAT) up 42.2% with the weakest performer being Pfizer up only 4.5%. For the coming year, 2017, two of the existing Dow Dogs, Procter & Gamble (PG) and Wal Mart (WMT) will be replaced by Boeing (BA) and Coca-Cola (KO). Boeing has a dividend yield of 3.65% and Coke has a dividend yield of 3.38%. Below is a list of the most read articles on our firm's blog in 2016. 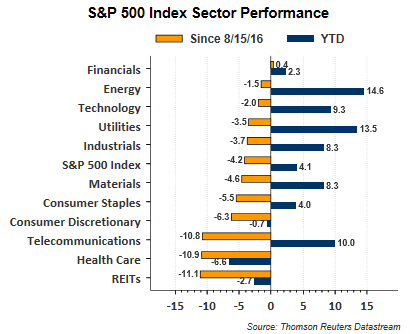 Our generally bullish view on the equity market for 2016 proved rewarding for our clients. 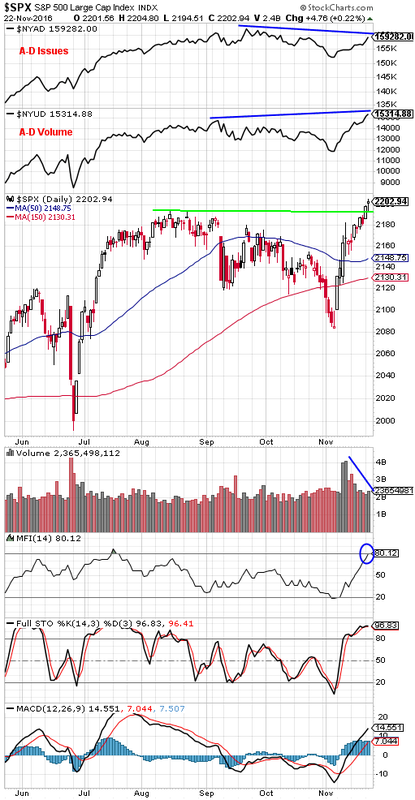 We stuck to our bullish call in January when the market was down 8% as noted in the second article link below. 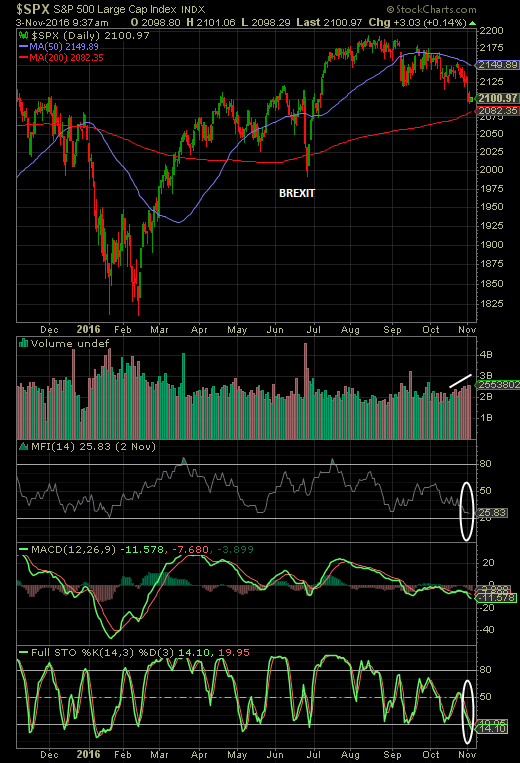 When the market began to sell off again into late May, we highlighted our view that equity market headwinds were positioned to subside as noted in the first article link below. Our year-end Investor Letter will be released on Tuesday and will contain additional thoughts on 2016, but more importantly, our outlook for 2017. To our clients and readers, we wish all of you a Healthy and Prosperous New Year. 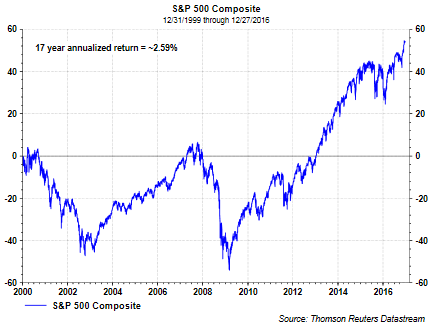 It wasn't until 2013 that the S&P 500 Index broke out 17 year time frame the annualized return (price only) for the S&P 500 Index is approximately 2.59%. 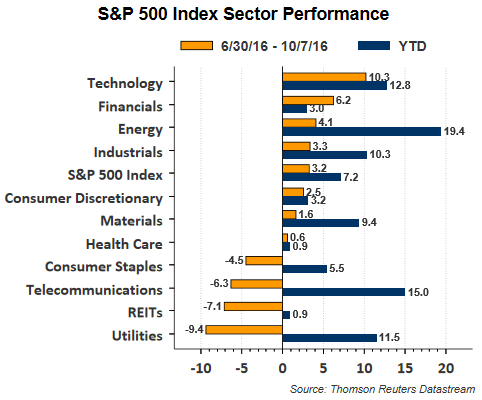 Has Broadly Improved Sentiment Pushed The Equity Market To An Extreme? 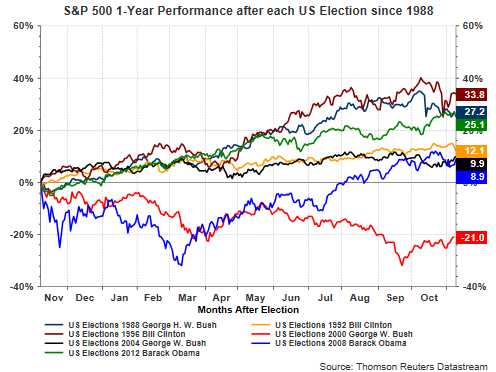 The market's advance since the presidential election has certainly been remarkable. 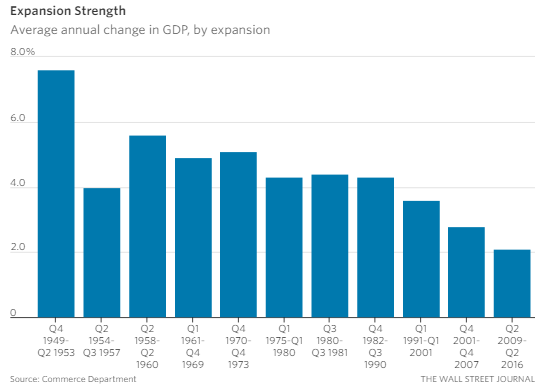 Much of the gain is being attributed to anticipated policies being proposed by a new Trump administration. 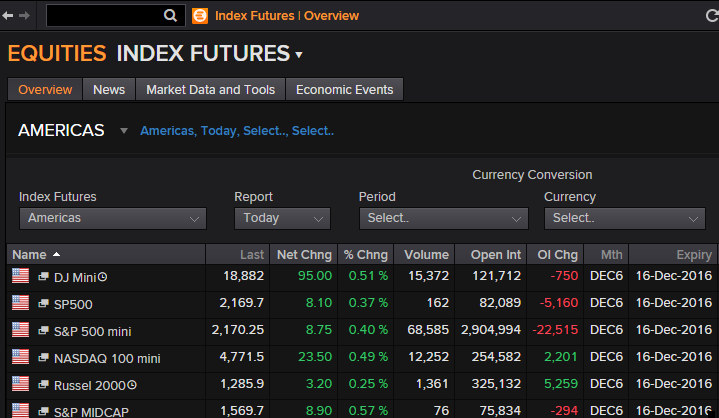 Obviously none of the proposed policies have been put in place as of yet, but the market is already weighing in with positive expectations. 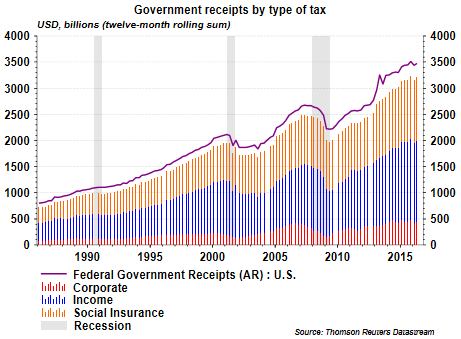 A common thought is whether or not the market has gotten ahead of itself. 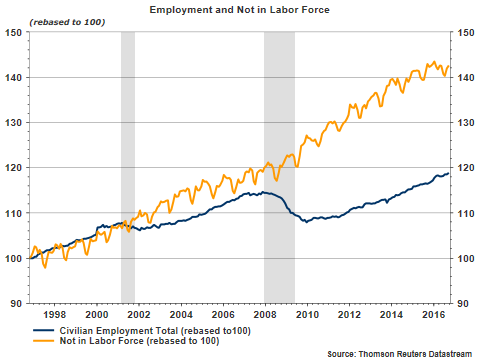 Given the rapid rise in such a short time period, the market certainly seems to be ahead of itself. 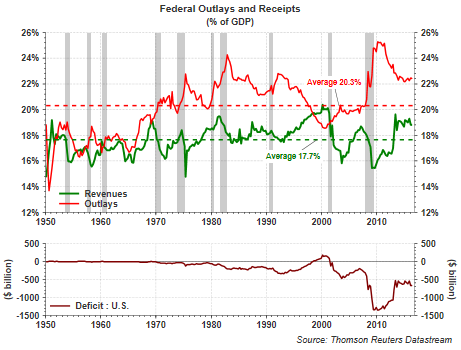 However, from a return standpoint, it may not be as can but seen in the below chart. Over the last two years the market's return totals just over 8% and all of the return has come since the election. This makes the average return over the last two years only about 4%. Much of the positive market sentiment has been driven by a strong improvement in various consumer and business sentiment indicators. 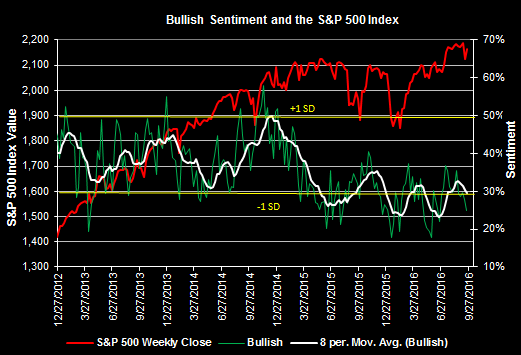 Below are a couple of charts showing the spike in a number of sentiment indicators. This morning I published a few tweets and charts on our Twitter site reviewing emerging market equity performance and the impact US Dollar strength has on emerging market equity performance. 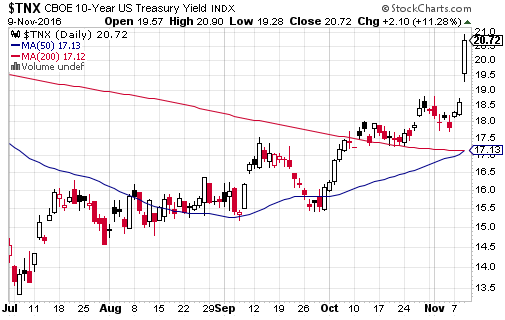 Additionally, interest rates influence US Dollar movement and rising interest rates tend to result in a stronger Dollar, all else being equal. Below are those tweets. I frequently provide market relevant tweets throughout the week so feel free to follow our firm on Twitter @HORANCapitalAdv. At the same time, readers may want to follow our broader firm, HORAN on twitter as well @HORAN1948. For over 65 years HORAN has created plans to control health care costs, protect your wealth and insure your life. But the end game for all that we do at HORAN is more than a set of plans. We believe good health and true wealth create a better quality of life for our clients and their families. 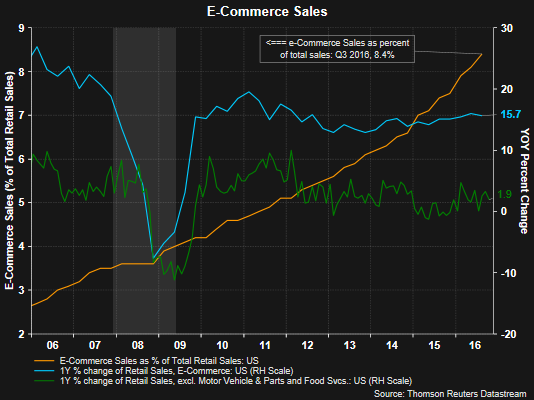 "Post-election confidence continues to build, lifting consumer sentiment by more than 4 points to a 98.0 level that hits the very outside of the Econoday range and is 1 tenth away from the index's recovery peak hit last year. 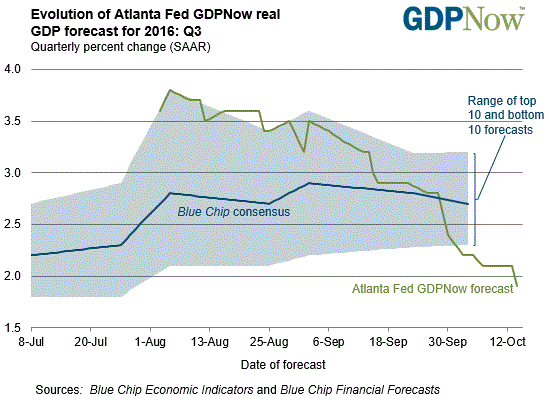 Consumers specifically cite expectations of new economic policies as the biggest positive." 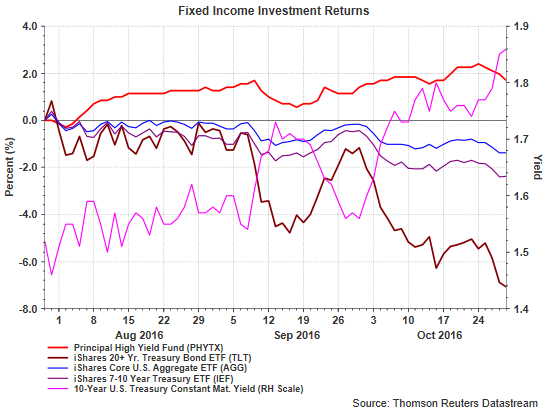 From a market perspective investors appear to be rotating out of the more defensive and income producing stocks (and bonds) into stocks that will participate in an environment of faster economic growth. 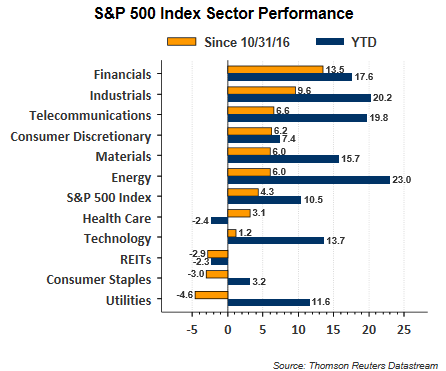 Top performing sectors in the S&P 500 Index since the election are, financials (+21.9%), industrials (+13.3%), energy (+13.0%) with the laggards being utilities (0%), staples (+.8%) and REITs (+3.4%). 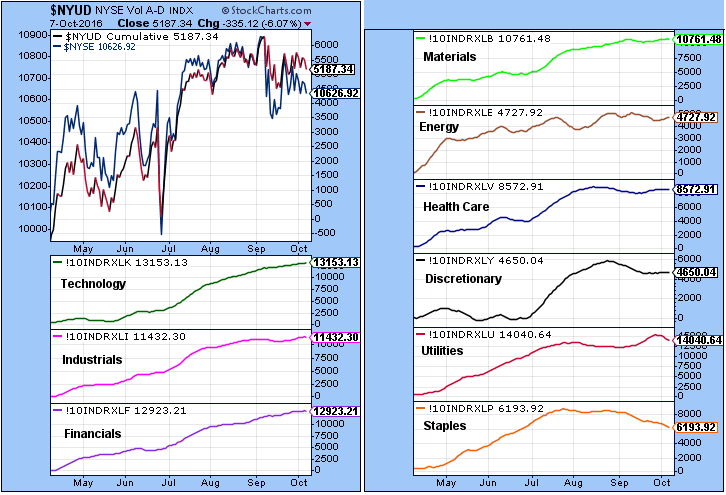 This rotation out of the defensive equities is showing up in the lagging performance of the Dow Dogs. The Dogs of the Dow strategy is one where investors select the ten stocks that have the highest dividend yield from the stocks in the Dow Jones Industrial Index after the close of business on the last trading day of the year. Once the ten stocks are determined, an investor invests an equal dollar amount in each of the ten stocks and holds them for the entire next year. As can be seen in the below table, the average return of the Dow Dogs over the last month equals 1.9% versus 4.7% for the SPDR S&P 500 ETF and 6.6% for the S&P Dow Jones Industrials Index itself. Whether or not we do or do not view favorably the outcome of the election, as investment managers, we continue to position our clients in sectors and market segments that might outperform under a Trump administration. This led to our positioning of client portfolios into stocks and sectors that might outperform under a faster economic growth environment. Subsequent to the election, the equity 'risk on' trade has been most evident in small company stocks with the S&P 600 Small Cap Index returning 13.0% since 11/4 versus a return of 5.4% for the S&P 500 Index. In fact, small cap stocks have been outperforming large caps since the market pullback in February of this year. 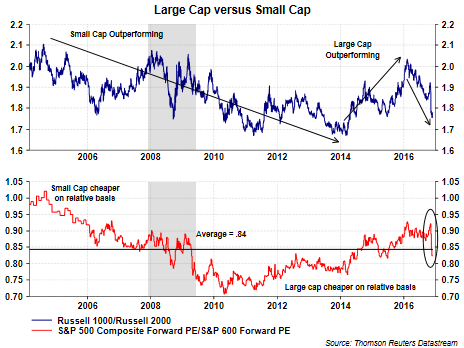 Benefiting the return of small cap stocks is the fact, based on their respective P/Es, they were cheaper than large caps on a relative basis as can be seen in the below chart. However, this spike in return over the last four weeks has put the relative valuation of small caps below the average relative value going back to 2004. 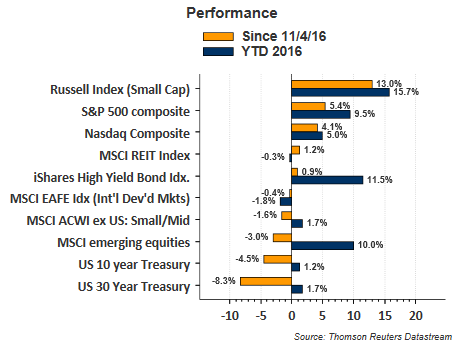 Given small caps burst of outperformance over the last four weeks, a period of near term underperformance would not be surprising and would actually be healthy. 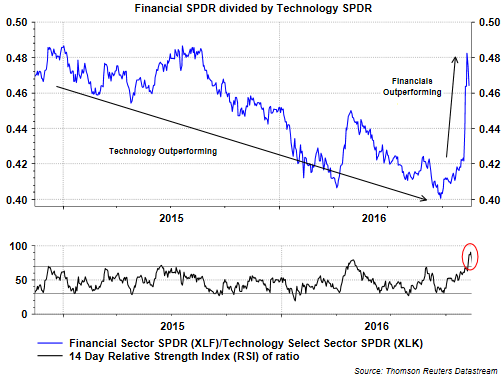 One factor likely at play though is the anticipation that small cap earnings will begin to accelerate as occurring in the large cap space. The third quarter will market the end of the earnings recession with S&P 500 Q3 2016 earnings expected to be up 4.2% versus Q3 2015. 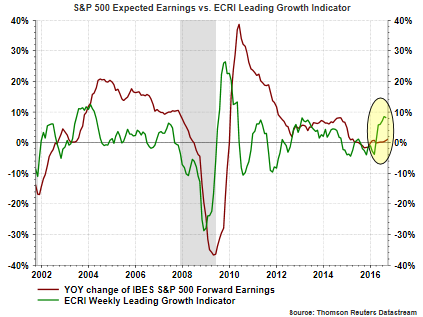 Looking ahead, Thomson Reuters I/B/E/S is estimating earnings growth rates for the S&P 500 Index for Q4 2016 through Q3 2017 at 6.2%, 14.0%, 11.9%, and 9.8% respectively. 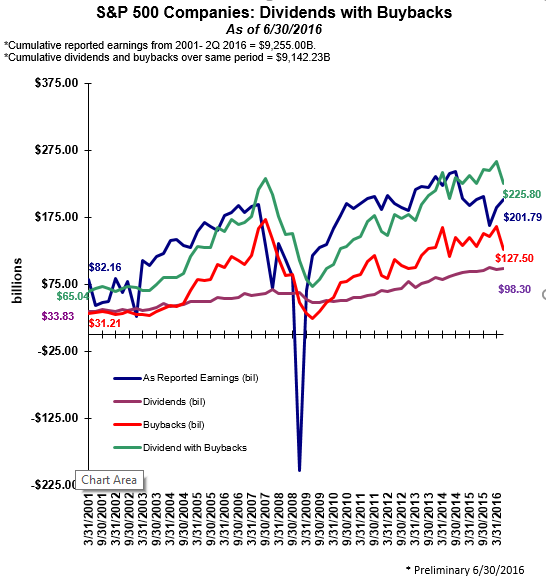 This improvement in the earnings picture may serve as a floor against an extended equity market pullback. 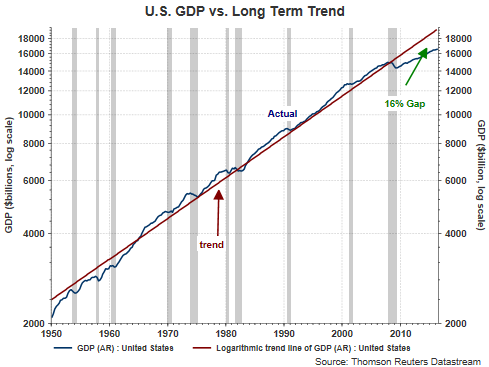 No single variable or statistic provides clear insight into the future direction of the economy or stock market. When a data point does not fit ones narrative though, justification to eliminate it seems to be gaining among some strategists. 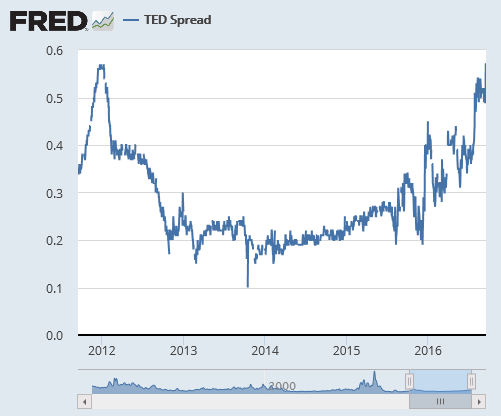 Recently, the market has seen a fairly significant spike in LIBOR and a resultant increase in the TED Spread, i.e., 3-month LIBOR minus 3-month Treasury. 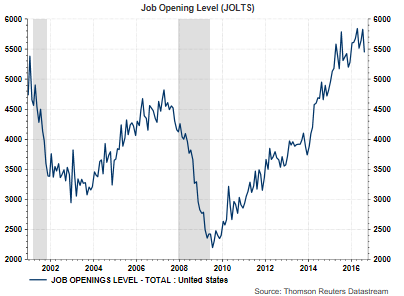 This morning the American Association of Individual Investors released their Sentiment Survey showing a 3.1 percentage point decline in bullish sentiment to 24.8%. 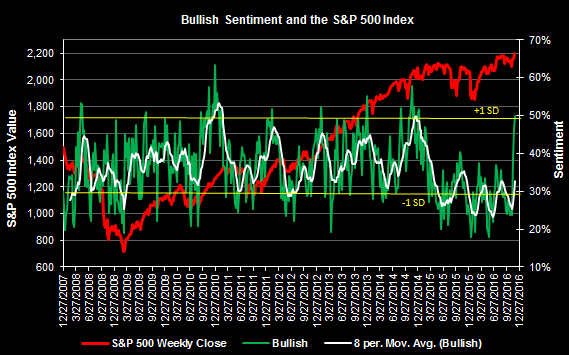 The bullish sentiment reading reported by individual investors remains below the -1 standard deviation level of the sentiment measure which is 28.3%.The 8-period moving average of the bullish reading declined as well to 29.6%. A vast majority of the decline in bullish sentiment showed up in bearish sentiment (+2.4 percentage point increase) with a net impact of widening the bull/bear spread to -13.5. 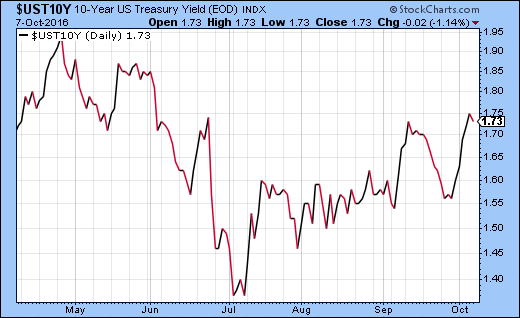 This is the widest the bull/bear spread has been since late May when the spread was -14.8. 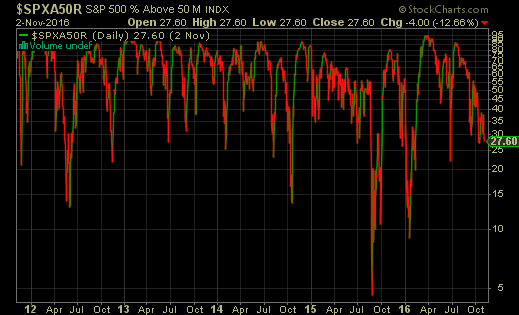 Since that point in May the S&P 500 Index is up 5.6% on a price only basis. 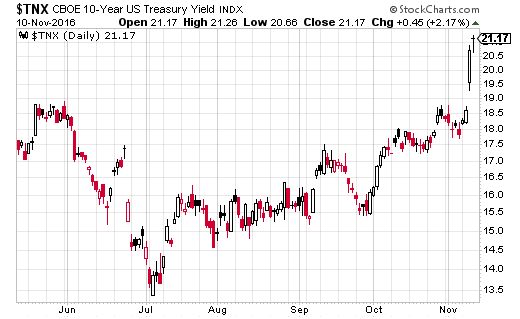 As individual investors continue to doubt the markets this year, they continue to move higher nonetheless. 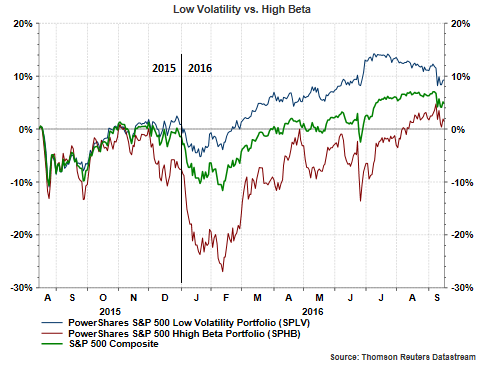 A little more than a year ago we wrote about the outperformance of the low volatility strategy versus a more risk on/high beta strategy. At that time it was noted low volatility could persist; however, if the broader market reached new highs, the high beta strategy would likely outperform low volatility. 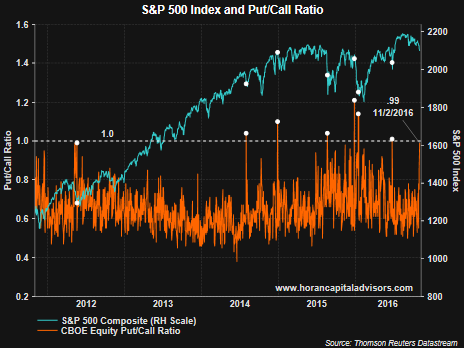 This has essentially played out and as the calendar turned to 2016 the early year market pullback saw the high beta strategy succumb to significant selling pressure and was down 20% into the February low, almost twice the broader market's beginning of year decline. 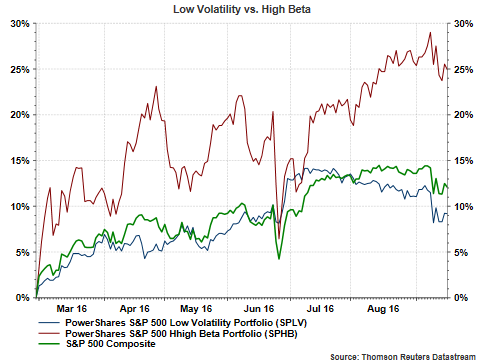 Once the market began recovering from the February low though, high beta has outperformed the low volatility strategy, 25% versus 9%, respectively. 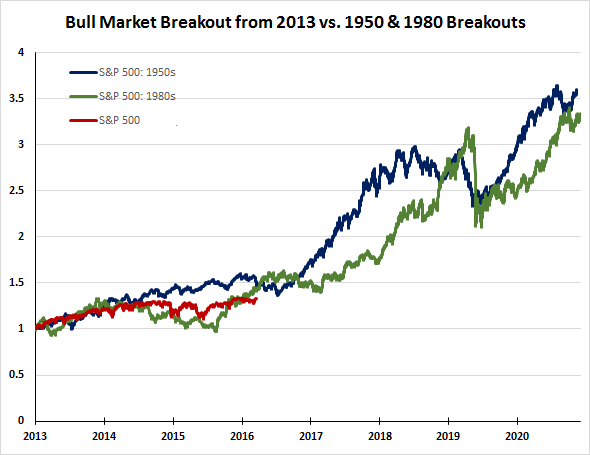 Three quarters through the year, the Dogs of the Dow strategy continues to be a winning one, outpacing the Dow Jones Industrial Average and the S&P 500 Index by nearly three times. 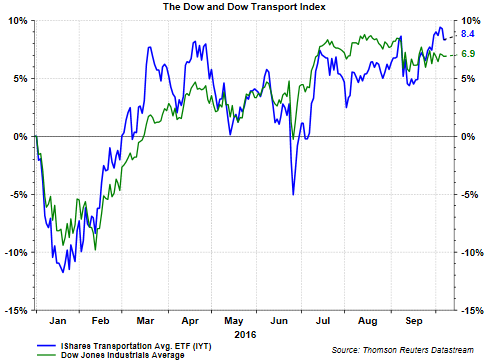 The average return of the 2016 Dogs of the Dow equals 16% versus the Dow Index return of 5.7% as of Friday's close. As noted in earlier posts, the Dogs of the Dow strategy is one where investors select the ten stocks that have the highest dividend yield from the stocks in the Dow Jones Industrial Index (DJIA) after the close of business on the last trading day of the year. Once the ten stocks are determined, an investor invests an equal dollar amount in each of the ten stocks and holds them for the entire next year. 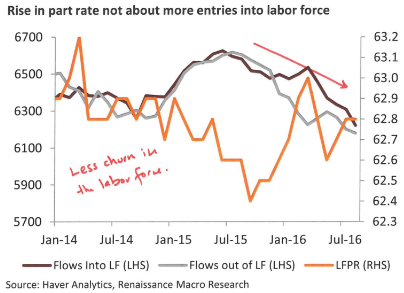 With the popularity of indexing, some investors have pursued the Dow Dogs strategy via an exchange traded note, the ELEMENTS "Dogs of the Dow" Linked Note (DOD). 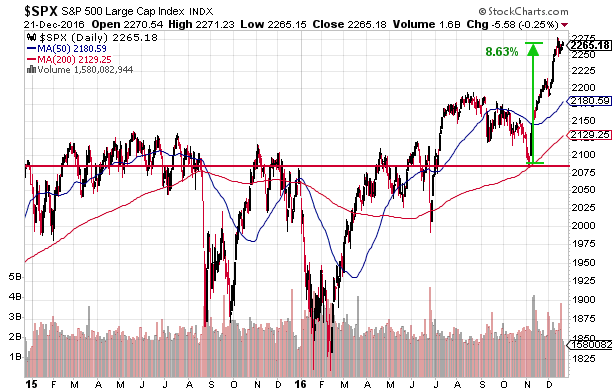 The return of this note has varied greatly from the performance of the Dogs of the Dow themselves. There are peculiarities with these types of exchange traded products investors should be aware of. More detail on the risk of exchange traded notes can be read here. Two important ones are the fact these investments are essentially bonds of the sponsor of the exchange traded note. In the case of DOD, the issuer is Deutsche Bank AG and an investor in DOD has unsecured credit exposure to Deutsche Bank AG. Secondly, the return on these notes are 'based' on some underlying index or basket of investments. 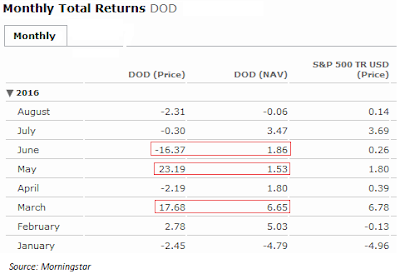 In the case of DOD the ETN's return is based on the Dow Jones Select 10 Total Return Index. Because the issuer is not required to issue more shares of the ETN, the price of the ETN can diverge from the value of the underlying Index and in some cases the divergence is significant. 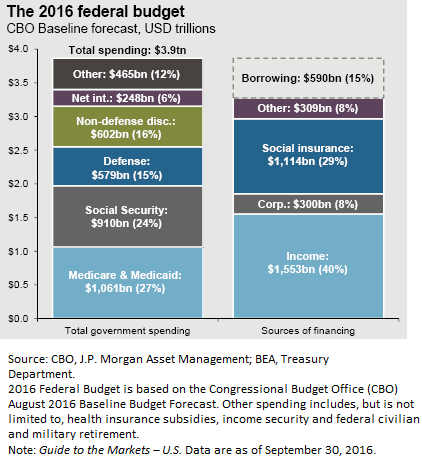 This has occurred with DOD as can be seen in the below chart. 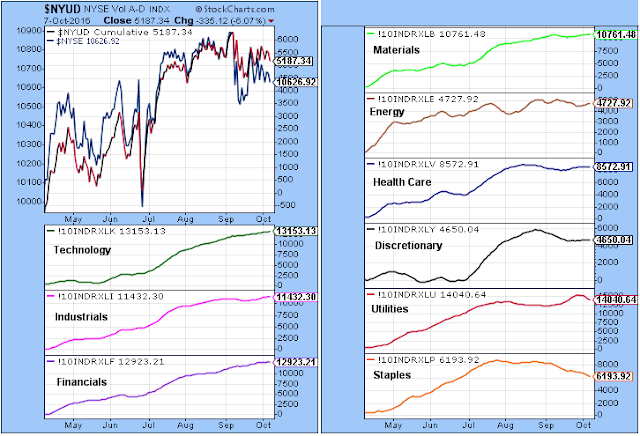 Year to date through early June DOD was up nearly 60% while the underlying Dow Jones Select 10 Index was up only 11.3%. As is typically the case, the large premium at which DOD traded quickly narrowed to the actual return of the underlying index. 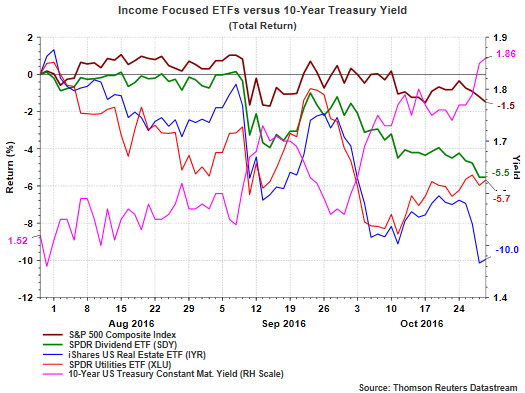 Lastly, in this low interest rate environment, investors have a heightened focus on income generating equities. From a total return perspective though, the Dogs of the Dow strategy has had mixed results from year to year.